Nathan Gunn can give me a haircut any time. The hunky baritone is the best looking (and sounding) thing in San Francisco Opera’s “Barber of Seville,” playing through Nov. 30 at the War Memorial Opera House. Sadly, despite the title, it’s not about him. Gioacchino Rossini’s beloved 1816 comedy of young love and old fools has at its heart the romance between Count Almaviva and Rosina and their attempt, with the aid of the wily barber, to outwit her guardian, the insufferable Dr. Bartolo. Rosina and the Count are back again in Mozart’s “The Marriage of Figaro,” written ‘way before Rossini and also based on the famed “Figaro” trilogy of Beaumarchais. In Mozart’s opera, as in the plays, Figaro is the central character – a servant who is brighter than his masters, a highly incendiary concept at the time. In Rossini, Figaro is a “fixer,” the guy who gets things done and, after his famous opening aria, “Largo al Factotum,” he does most of his singing in ensemble. And, in this frenetic production, directed by Roy Rallo, even the “Largo,” sung on and near a bright red motorcycle as Figaro rides around and shaves a customer, gets lost in the stage business. “Hey Figaro,” come back. We want to hear you sing! Gunn may be the headliner but there are some excellent singers portraying Rossini’s rogue’s gallery of characters. Allyson McHardy is a pert, pretty Rosina, setting the stage for mischief with “Una voce poco fa” and singing beautifully throughout. It’s a little hard to understand why the director has paired her with a stuffed kangaroo. Her lovely face, voice and knockout costumes (by Yan Tax) are quite enough. Her guardian, Dr. Bartolo, who wants to keep her for himself despite her wishes and the difference in their ages, is well-sung and acted by Bruno de Simone. His confederate, the goofy music teacher, Don Basilio (Phillip Ens), is spot on as well, his “La Calumnia” duet with the doctor a highlight. The always-reliable Catherine Cook makes a fine Berta, the woebegone housemaid. Only John Osborn, as the Count, strikes a false note. His thin, vibrato-laden tenor is not quite up to the demands of the music and he does not have the bearing of a nobleman. Alas, a red leather coat doth not a hero make and the first act strip tease, where a bunch of musicians rob him, not only of his purse, but most of his clothes, does not increase his dignity. Perhaps it’s not Osborn’s fault at all. There is a plethora of comic shtick in this production, some successful – like a garden umbrella that floats away in the last act storm scene – and some merely distracting. 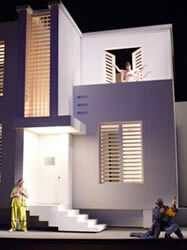 Another major distraction is Hans Dieter Schaal’s set, a huge white modern structure that revolves to reveal multiple rooms in Bartolo’s house as befits the action. And sometimes just revolves gratuitously. Another indication that opera has increasingly become a director’s game in recent years. But it’s still about the music and the music here is delightful. Conductor Maurizio Barbacini and the orchestra score a hit right out of the box with the familiar overture and just keep on going. The ensembles, particularly the first act finale and the elopement trio, “zitti, zitti, piano, piano,” are quite wonderful. This “Barber” is not, by any means, a close shave. One just wishes the director had taken a little more off the sides.